Cold callers will be given the cold shoulder if they venture into part of a WDH estate where residents have taken a stand against unwanted visitors. 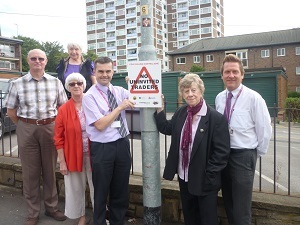 WDH joined forces with West Yorkshire Trading Standards Service to set up the first Cold Calling Control Zone in the Stanley and Outwood ward in Wakefield aimed at deterring rogue traders and pushy salespeople. 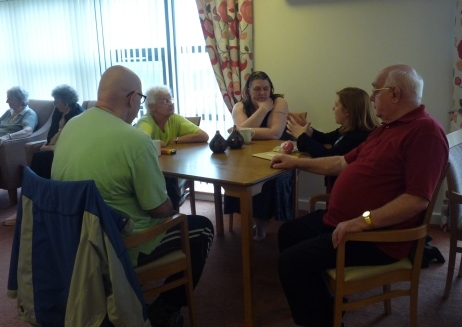 Residents in Bevin Close, Outwood, which includes WDH flats, bungalows and houses as well as a number of private homes, were invited to a coffee morning and launch event at the community centre. Four signs have been put up and stickers and leaflets were given to residents as part of the campaign, which has seen an increasing number of Cold Calling Control Zones being set up across the district to prevent doorstep crime and give residents the confidence as a community to turn away uninvited callers. For further information on Cold Calling Control Zones please visit call Citizens Advice Consumer Helpline on 03454 040506. 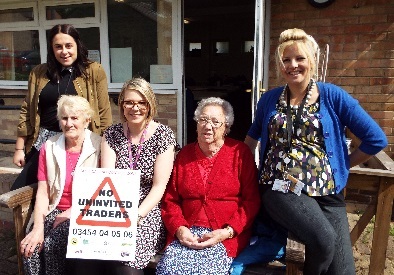 Pictured (from left) are Sammy Rockett (WYTSS), Bernice Jenkins (resident), Kathryn Hutchinson (WDH), Margaret Spooner (resident), Annette Howard (Wakefield Council Engagement and Outreach Officer).